I’m not talking about the superficial sincerity you try to muster into your facial expression when you tell your friend their dodgy haircut looks great. It’s not in the tone you try to force into your voice when you tell your significant other they didn’t burn the (completely black) steak and that it tastes fine. 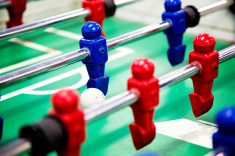 Growing up, we all picked our sides; cowboys or indians; ninjas or samurai; the (very talented) blue players or the (slower, less skillful) red players on a foosball table. As much as I loved those genetically mutated turtles who ate pizza and ran rampant in the sewers, I was never really a ninja kid. Personally, there was something about the samurai class that I was always drawn toward. This affinity for the samurai travelled with me well into adulthood. There was a certain romanticism about them. They were, to me, the very definition of warrior poets. I studied Bushido (the way of the warrior) which inevitably led me to stumble upon Yamamoto Tsunetomo’s work, Hagakure: The Book of the Samurai. I found that the more I read, the more disappointed I became. The teachings were often elitist, sexist, selfish, ruthless, and sometimes extremely barbaric. A player from team blue with the foosball, presumably about to score due to poor red defending. I found myself able to forgive these massive flaws, however, when I put everything into the proper perspective. These men were not by nature the skilled killers they had become famous for. They were born the same as you and I. These men could be our fathers, our brothers, our husbands, or our boyfriends. These men were capable of love, compassion, mercy, and generosity. I found it fascinating that they were able to completely transcend their humanity in becoming samurai. I felt myself drawn to the teachings that helped these men – who were people just like you and I – rise above the human restrictions they were born with. Most of us have no desire to transform ourselves into heartless marauding mercenaries, myself included. That doesn’t mean there are no important lessons to take from Hagakure and the legendary code of the Samurai. I think we’re all looking for a higher version of ourselves. We all have a deep seated desire to become someone that reaches beyond the limitations we’ve all convinced ourselves we have. Yamamoto’s teachings emphasised a single word that, until that point in my life, I had never placed much importance on. There will be many giants for us to face in this life; we must face them like samurai; we must face them with sincerity. In the Hagakure, the importance of sincerity is constantly stressed. It emphasises the absolute necessity of sincerity in not only self improvement but in all aspects of our lives. I’m talking about true sincerity, the kind that can only flourish inside of you. You can put on a Leonardo DiCaprio-esque performance to the rest of the world, but you can’t fake true sincerity to yourself. There is no such thing as almost sincere, or partially sincere. Whether it’s an action you’re taking, a plan you’re making, or words you’re speaking, you either absolutely mean it with every last fibre of your being, or you don’t. Sincerity does not only complete the self; it is the means by which all things are completed. As the self is completed, there is human-heartedness; as things are completed, there is wisdom. This is the virtue of one’s character, and the Way of joining the internal and external. Thus, when we use this, everything is correct.” – Yamamoto Tsunetomo, Hagakure: The Book of the Samurai. It is an extremely simple and logical concept. Sincerity is the distinguishing factor between those who actually want something and those who only claim that they do. Many people wish to lose weight; those who take it upon themselves to research proper nutrition and exercise before implementing what they’ve learned into their everyday life exemplify sincerity. Those who take the option of a gluten free bun for their burger, before adding a large fry and a coke, are those who are demonstrating insincerity. Sincerity will quickly show you results and insincerity will leave you wondering why you’re not achieving your goals. 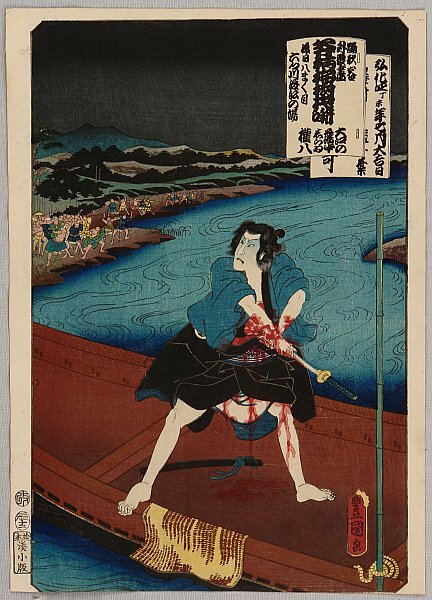 The samurai, for example, were so sincere about living an honourable life that they would actually disembowel themselves – a practice known as seppuku – rather than shame themselves in battle or die a dishonourable death. This practice is actually one of the things I found barbaric about the samurai, but there is certainly no denying the absolute sincerity by which they lived their lives and by which they honoured their code. They were willing to sacrifice (literally) everything to obtain and maintain something as intangible and obscure as honour in their lives, while most of us couldn’t even give up chocolate for lent. Through sincerity they were able to completely transform their human selves into automatons of destruction. Sincerity was the power behind their ability to become the fearless, emotionless, masters of death that they were. Sincerity is present in every aspect of life. In sports, sincerity lives in the child who gets excited for practice, who studies the game. Insincerity lives in the child who’s playing because his parents want it for him, or because it could translate into millions of dollars. Insincerity exemplifies itself in the workplace, in those who switch onto autopilot for forty-plus hours a week in a job they chose because there was a market demand or because it sounded prestigious. Sincerity emits from the ones who jump out of bed in the morning because they’ve chosen to do something they love, regardless of the money they make or the status it brings them. The more we look for sincerity, the more apparent it becomes. The more we act with sincerity, the more we’ll develop a reciprocal relationship with it. When we act out of sincerity, sincerity acts back. It acts back in the form of noticeable improvements, lessons learned, successes, and (most importantly) failures. These failures tell us we’re on the right path, they tell us we’re going in a sincere direction. When we speak with sincerity, sincerity responds. It responds in the form of advice from others, grapevine opportunities, offers of help, and real talks with those around us. When we love others with sincerity, with all of our soul, our lives become full of love that is – in turn – sincere. Life becomes simple when you live it with sincerity. Be sincere with every one of your actions and words. Be sincere with those around you. Most importantly, be sincere with yourself. And you’ll find the life you attract is sincere to you.